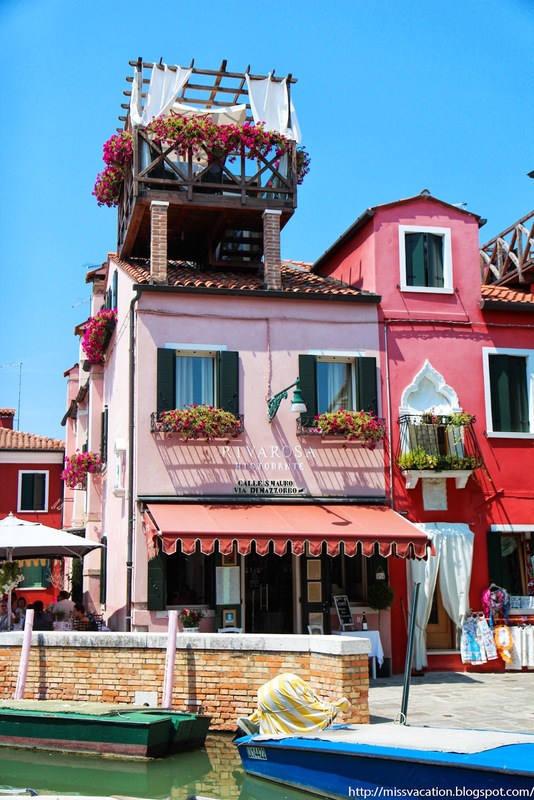 We didn’t get a chance to visit the nearby islands of Burano and Murano last time we were in Venice and I told myself, I have to visit them both the next time! 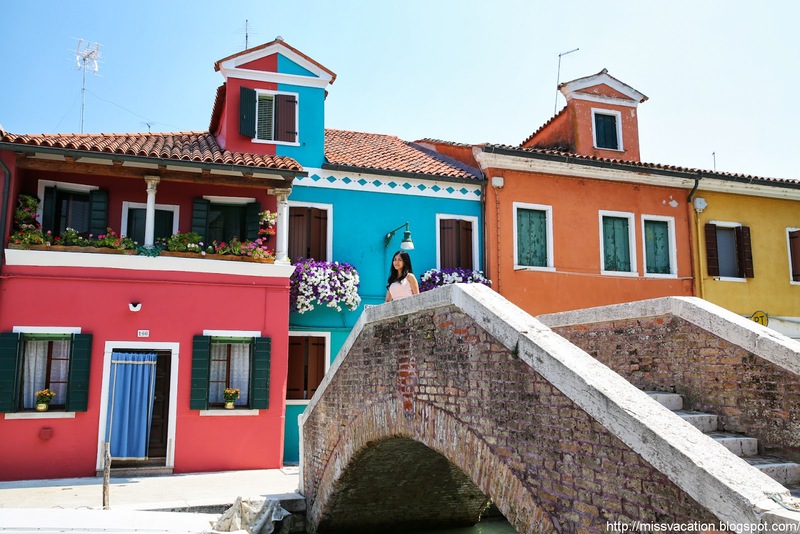 So I made sure we have a day trip to Burano and Murano this time! And we were very glad we went because both islands were amazingly beautiful! 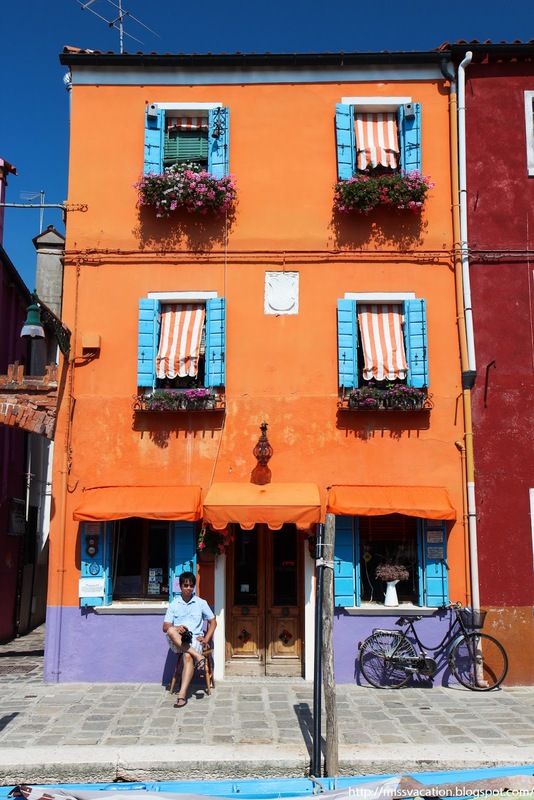 We woke up early in the morning so we could be at Burano early in the morning before it is packed with tourists. 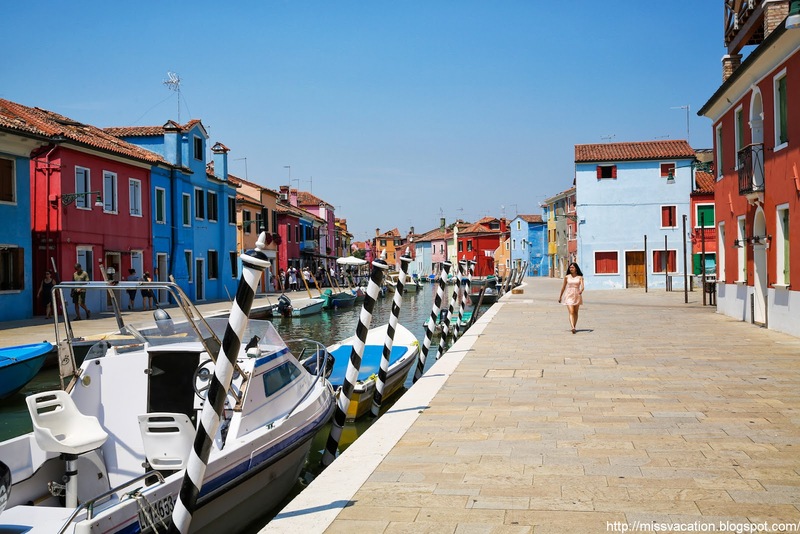 It was pretty easy to get to Burano; we took the route 4.1 from Zaccaria (St Mark’s Square stop) to F.TE NOVE “B” then walked over to F.TE NOVE “A” to switch water bus to route 12 to Burano. It took almost an hour and a half with wait time in between the two lines. It was a long boat trip but definitely worth it! 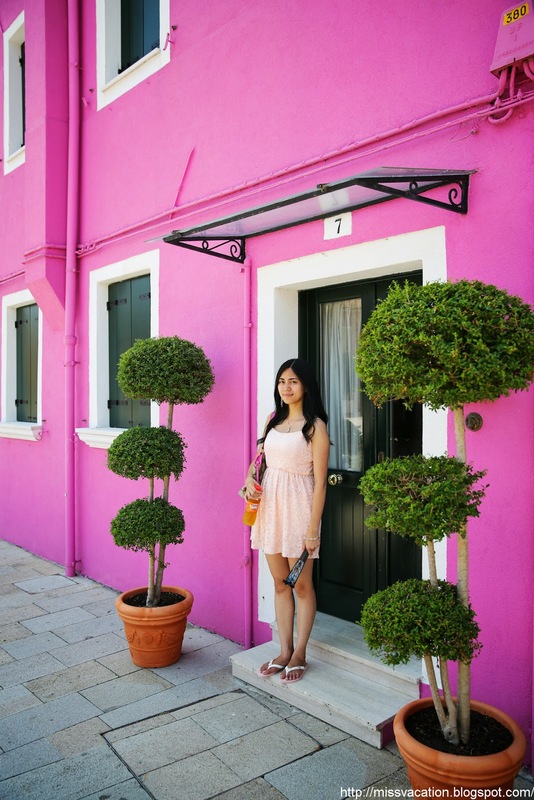 We arrived Burano around 9:30 am and the island was nearly empty; we felt like we have the whole island ourselves! From the water bus stop, we walked straight to the end of the street where this very cute pink cafe is located. It looked like it came right out of a story book like a toy house don’t you think? If I can choose a house to be my childhood dream house, this will be definitely it! That area was where most of the online photos I seen taken from, the pastel and bright colored houses on each side of the canal. I had this pictured in my mind but it turned out to be more colorful and beautiful. Just by looking at it, it already made me happy. Doesn’t this look like a dreamland? Please don’t wake me up! In fact, the color of the houses are regulated! No two houses next to each other have the same color! We walked by each house and whenever we saw a house we like, we’ll stop and have few photos with it. It was so much fun doing so! 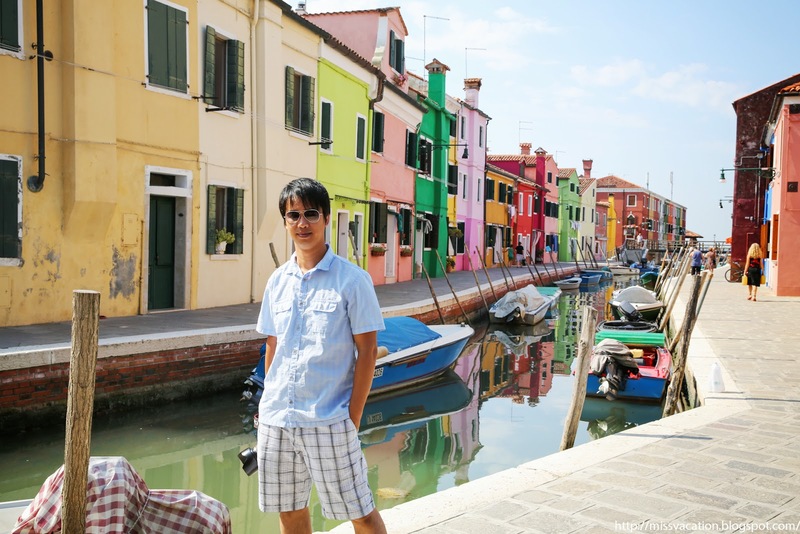 I love the reflection of the colorful houses as well….another reason to be here early! I never thought orange, blue, and purple could match so well together! Another side of the same street…gorgeous! I like light colors but this bright pink somehow caught my attention! I told hubby to run over to the other side of the canal to take a photo of me, the houses, and reflections! This is one of my favorite photos! How can I not have a photo with a pink boat!!! After the main street, we walked through small streets and let me tell you, the whole island houses are colorful not just the main street houses! 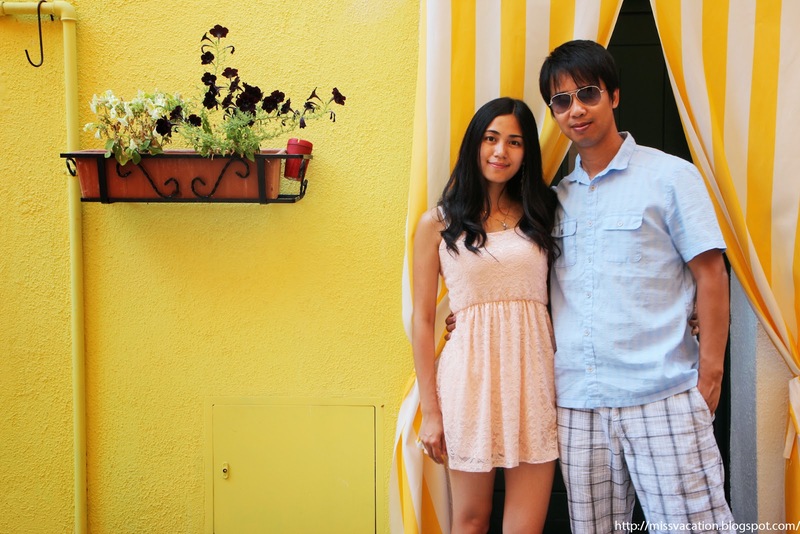 We stopped by this yellow house and placed my camera on the window of the house opposite of it to take a photo of us two LOL! It was the best photo of us together of our trip except the ones we used a tripod! Now I am looking at it…..it looked like a greeting card!!! 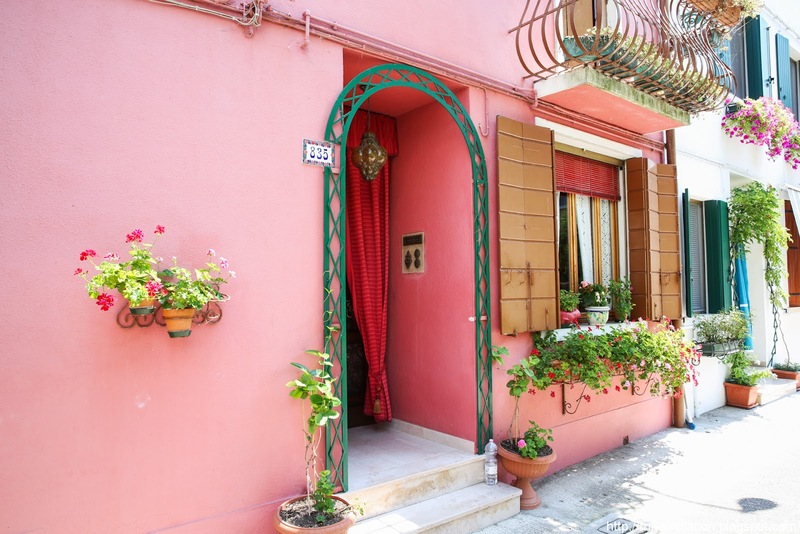 Then we saw this fuchsia colored house with color matching flowers, I just like it so much!! We had so much fun that time passed by quickly! It was already lunch time! 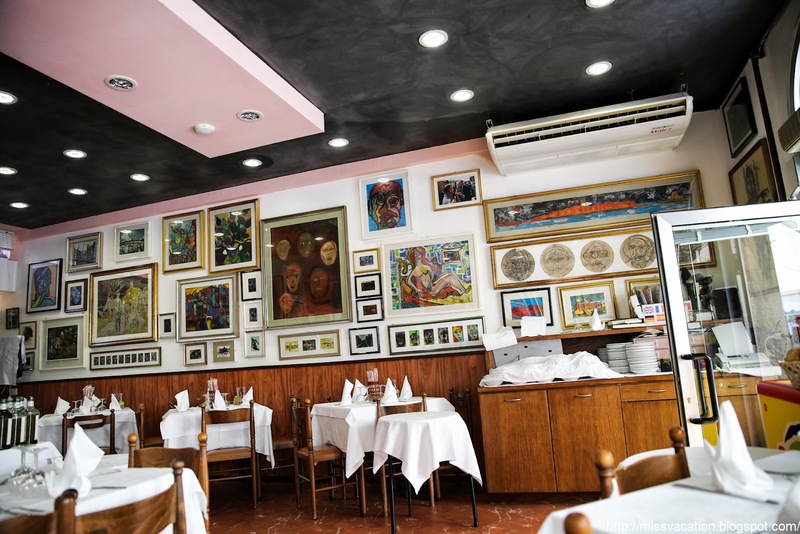 I was planning to have lunch at Da Romano (address: Via S.Martino DX 221) after I read a lot of good reviews about it but unfortunately there was a death in the family so the restaurant was closed when we were there!!! 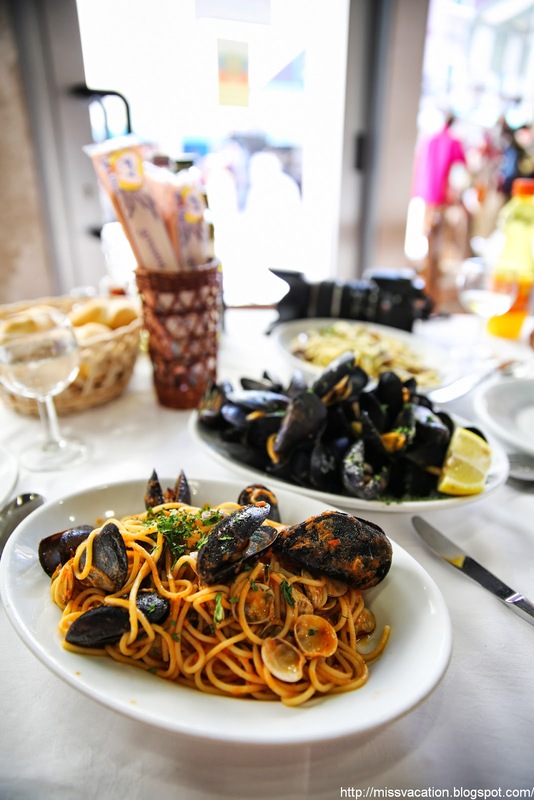 We checked out menus from a few restaurants nearby and decided to have lunch at Restaurant Galuppi. 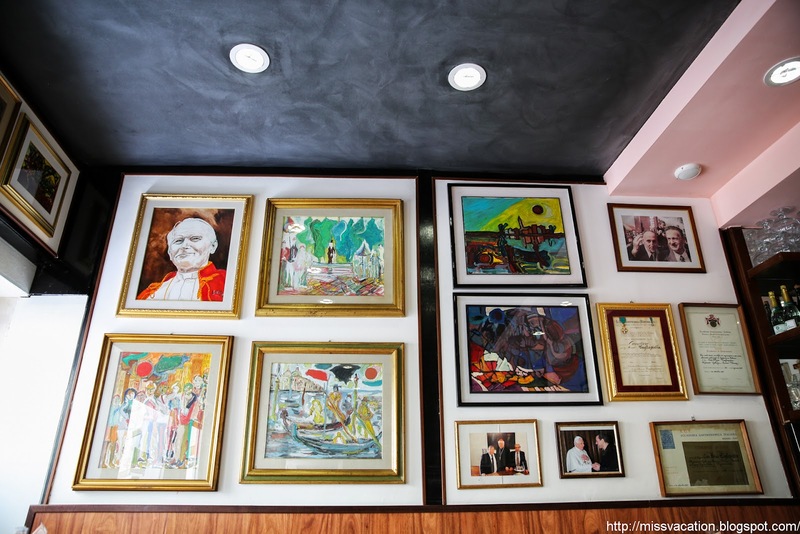 The interior decors were nice with a lot of paintings, the food was just okay…a little bit on the expensive side: two pastas and mussels as appetizer total 44.55 euros!! 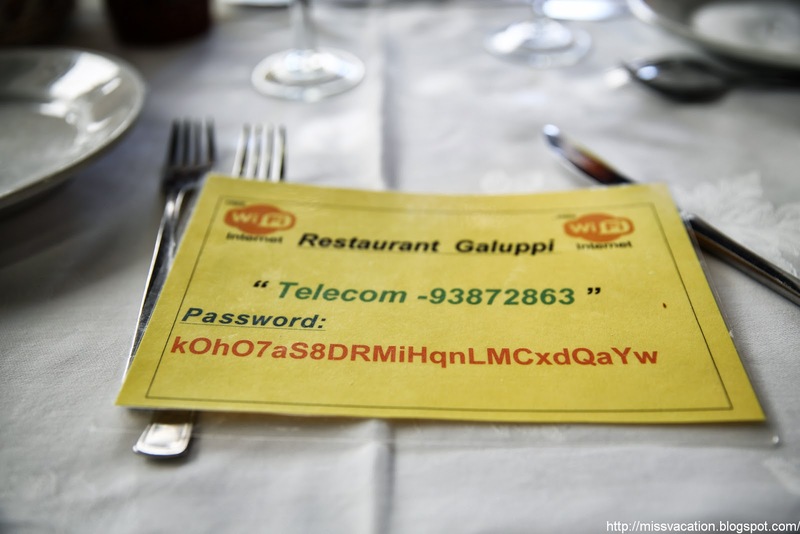 The restaurant has wifi and this is what they gave me for password…the longest password I ever seen in my life lol….wondered who can remember that!! 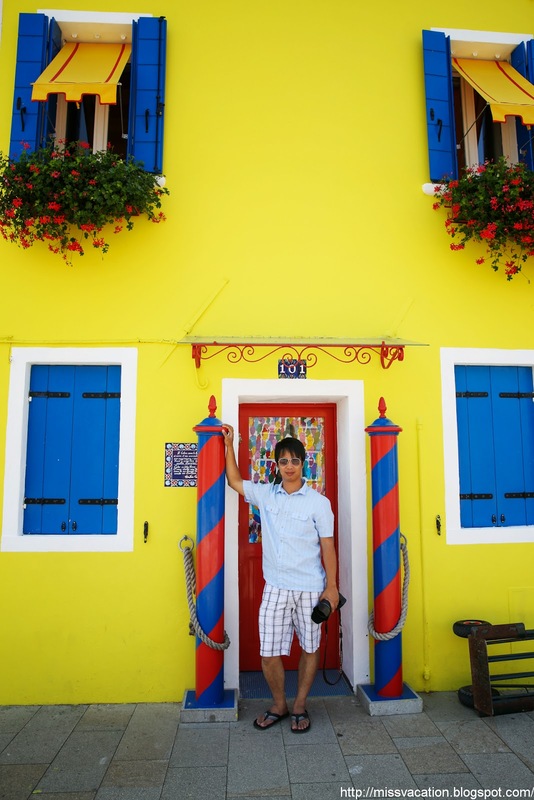 After lunch, we headed to the other section of the island…still filled with colorful houses! A house with a very leaning tower!!! Oh, a local fishing right in front of his house woah! 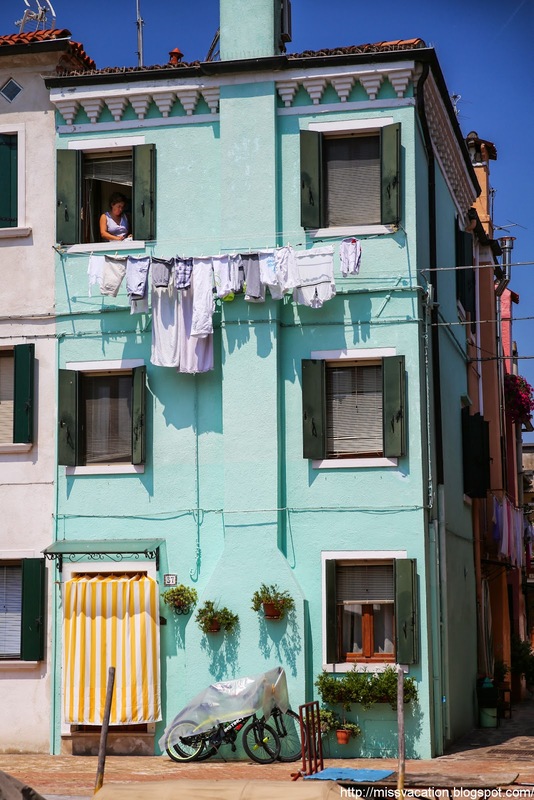 I saw this pastel green-blue house with matching colored plant of course and this lady was doing her laundry! 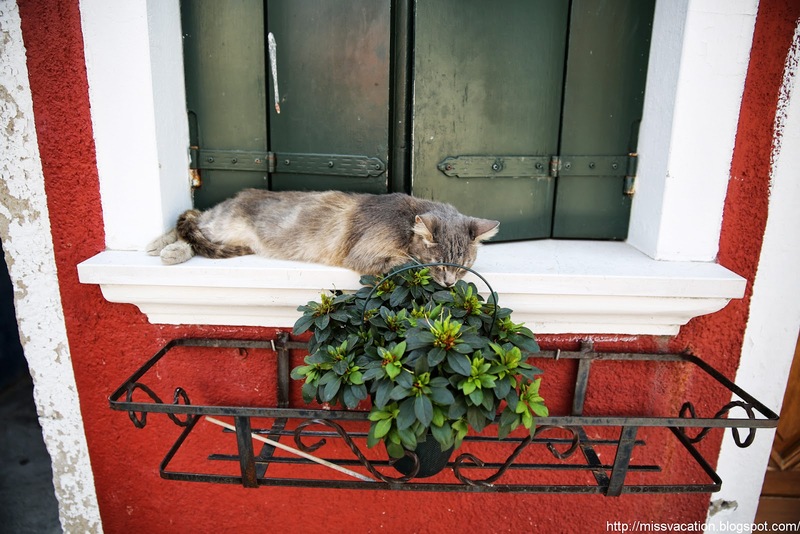 Even the cat on this island is relaxing! My favorite pink!!! 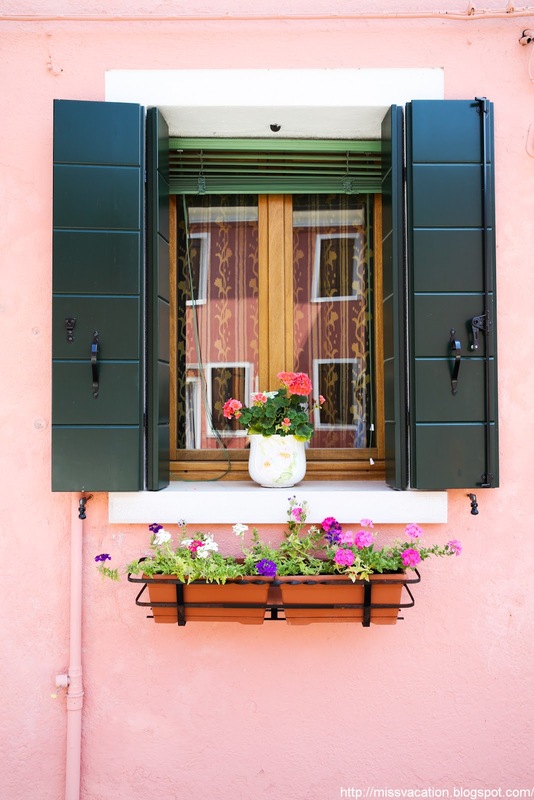 What I really like about Burano is that locals really spend time on color matching their houses and well decorated with flowers and plants! No one house is the same!!! 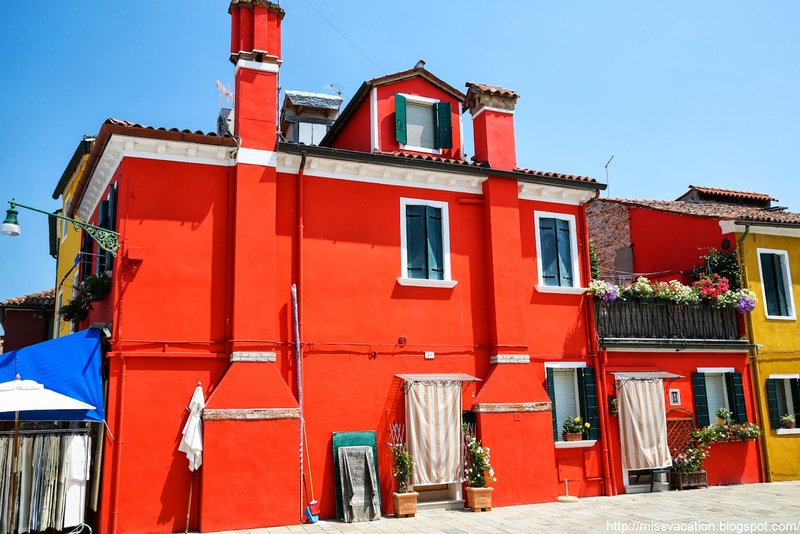 A very bright red house…reminded me of Memo! Another fuchsia house but decorated with two green plants on the entrance! Hubby likes this yellow house with the blue windows and the two barber-poles at the front door! 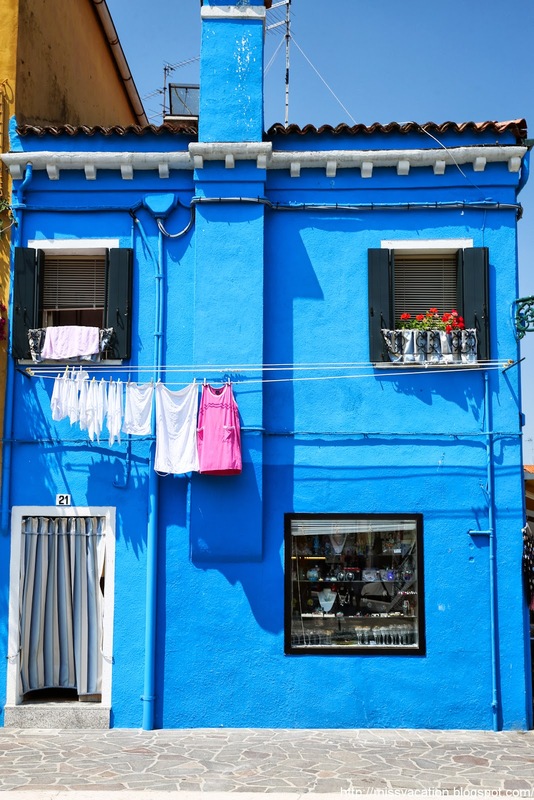 A blue house hanging a fuchsia shirt, the color contrast really stand out! My favorite pastel pink with color matching curtains and two hanging plants! 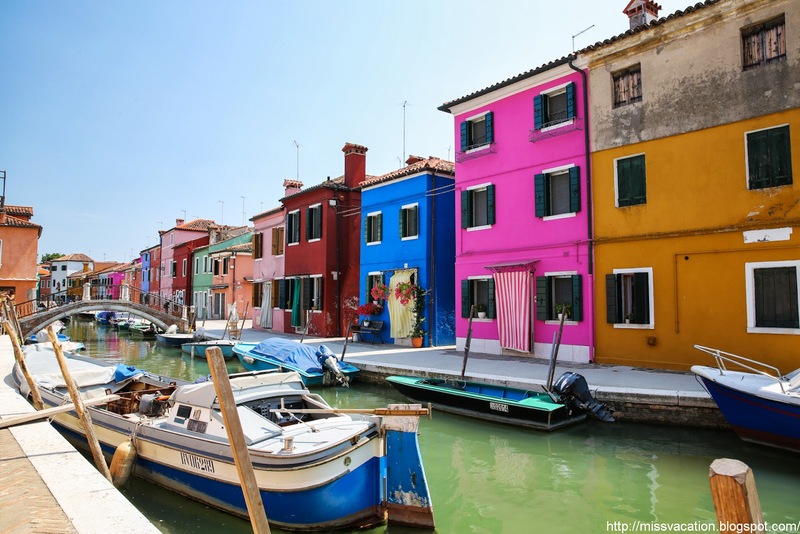 Burano is really like a dreamland! 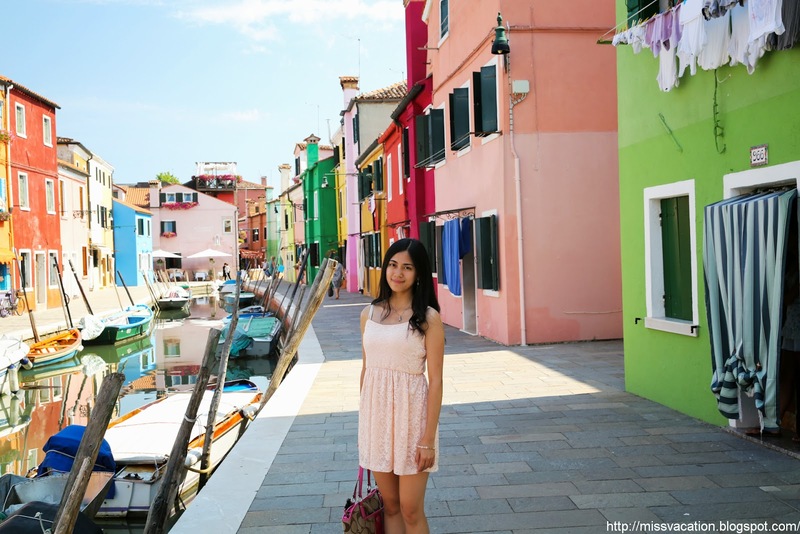 It is the most colorful island I ever seen in my life! 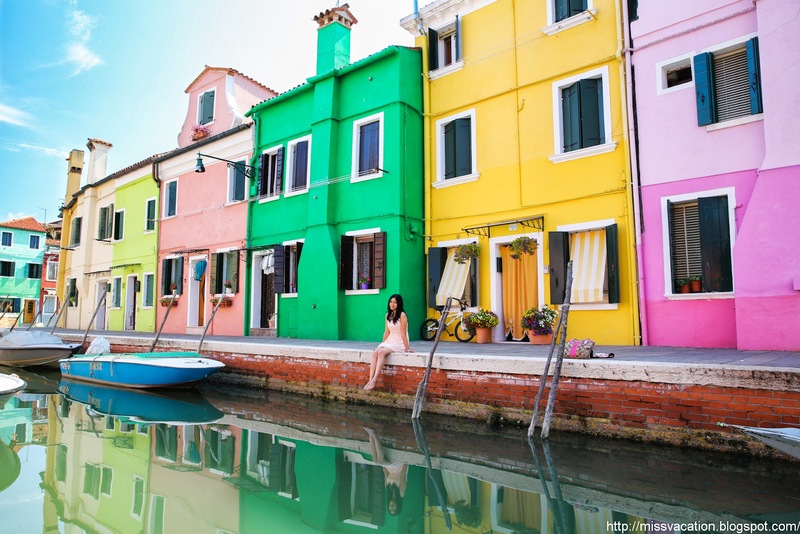 If you seen another other island more colorful than Burano please let me know!! 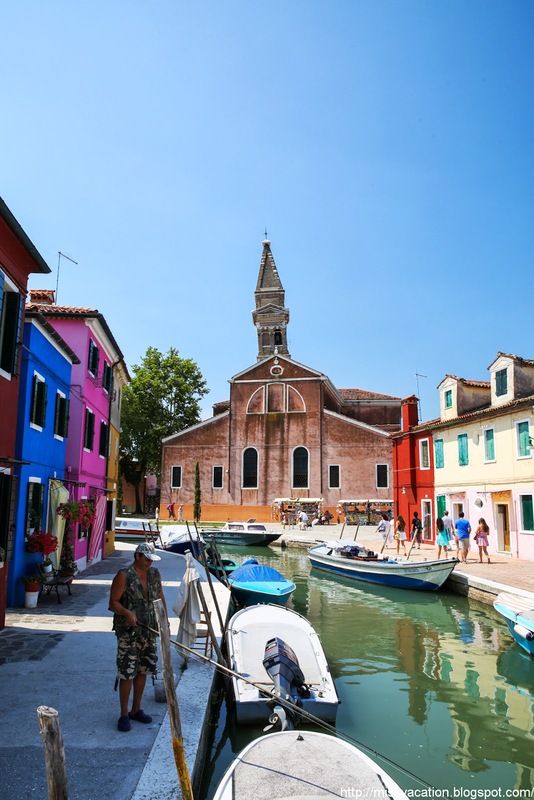 We left Burano at around 2 pm and headed back to stop by at Murano – island famous for its glass. 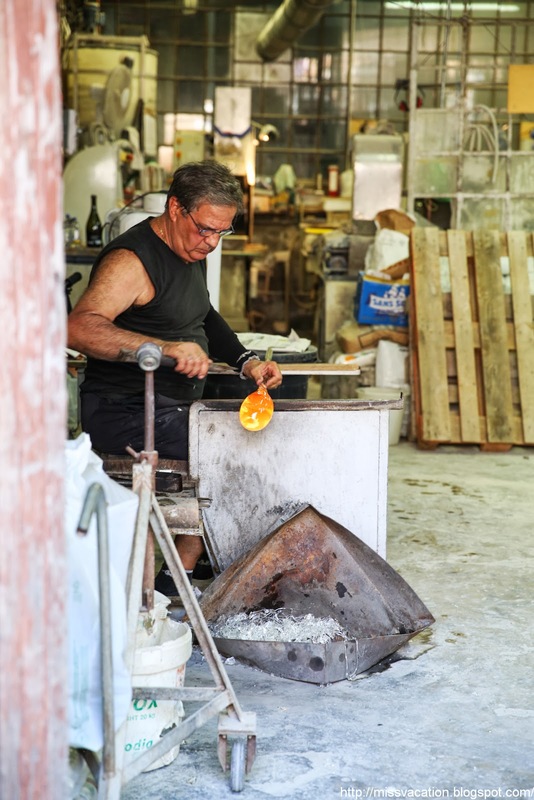 I pictured Murano as an island filled with glass souvenir shops and factories…I was wrong! It was not the factory as I pictured factory to be…but instead, the island is similarly beautiful as Burano but bigger in size! First, we walked pass a glass factory where they open their back door so tourists could see the factory…workers blowing glass. We didn’t get to see the actual blowing the glass though! 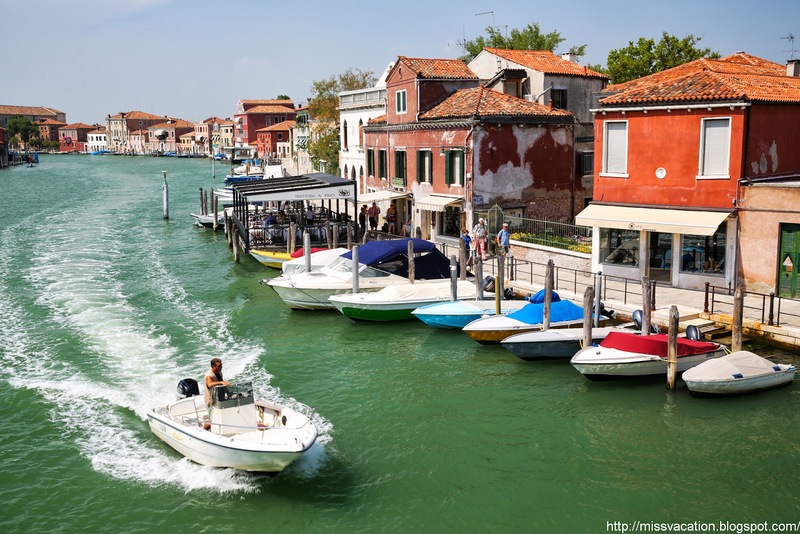 After we walked straight from the Murano stop (Murano island has many water bus stops….I forgot which one we got off though), we turned right and both side of the canal was filled with souvenir shops! Instead of shopping, we enjoyed the view of the island more! 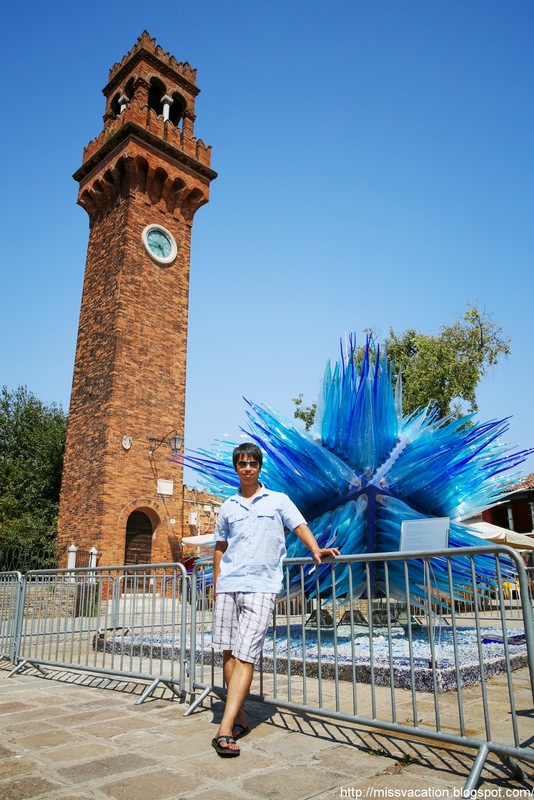 The big huge blue colored Murano glass display right at the front of a bell tower! I didn’t realized hubby took this photo LOL! 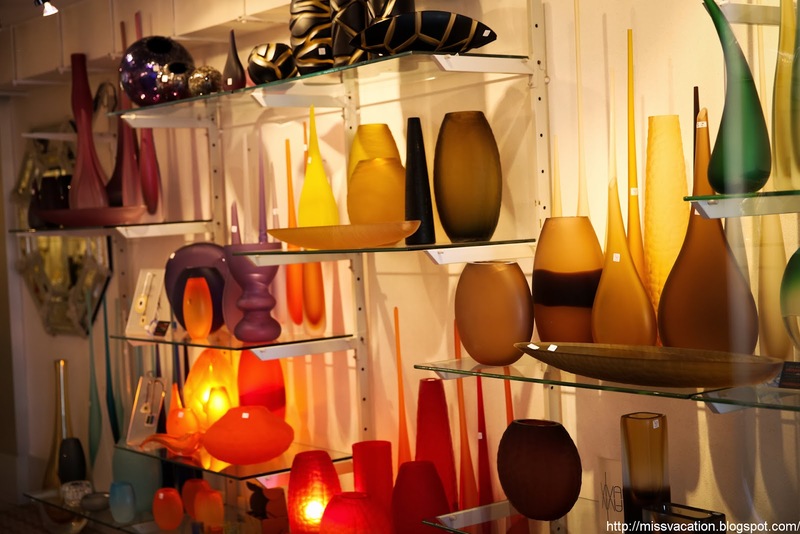 Very nice but expensive Murano glass! 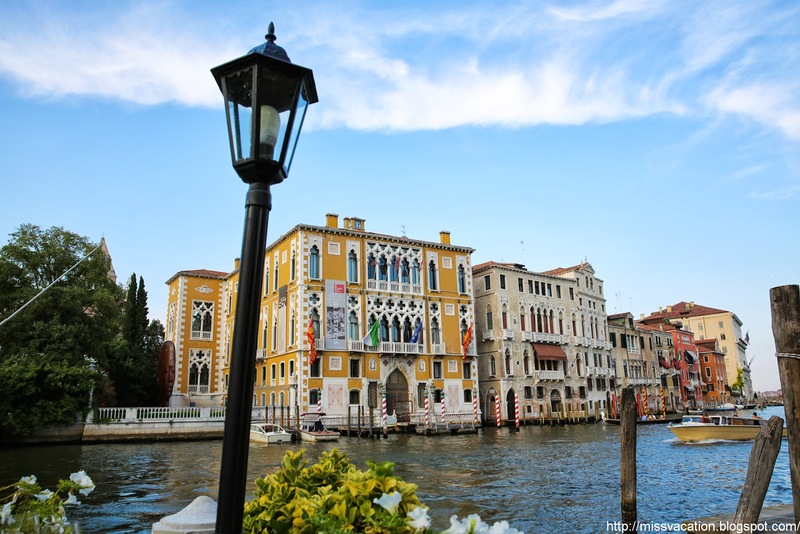 The Grand Canal of Murano! 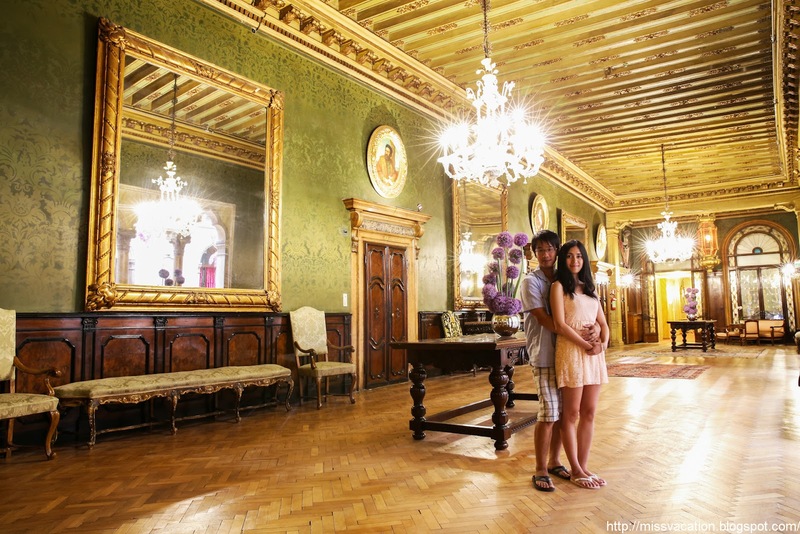 We left Murano around 4 pm and rest a bit in the hotel before heading out for dinner. Today, I insisted on having pizza! I told hubby that if I didn’t get a chance to have pizza in Italy this time, I’ll regret it LOL! 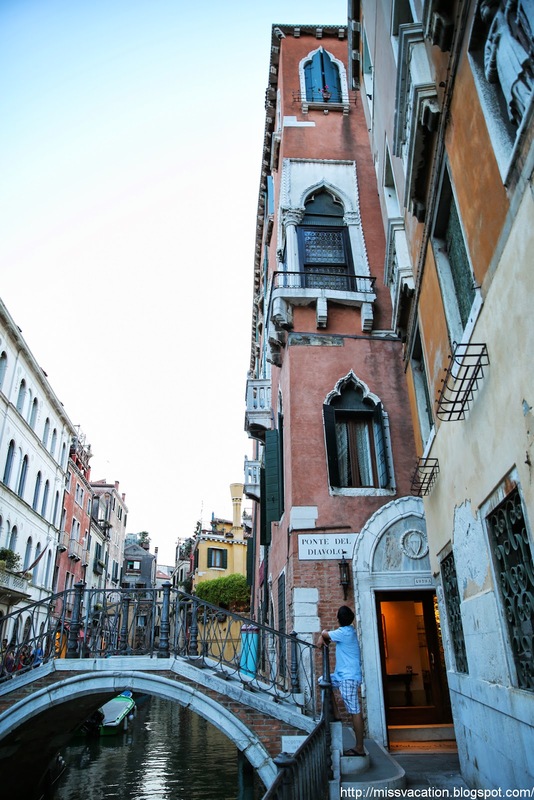 We took the water bus to Accademia since we purchased a 36 hours travel card to save us time and energy to walk all the way there from San Marco! 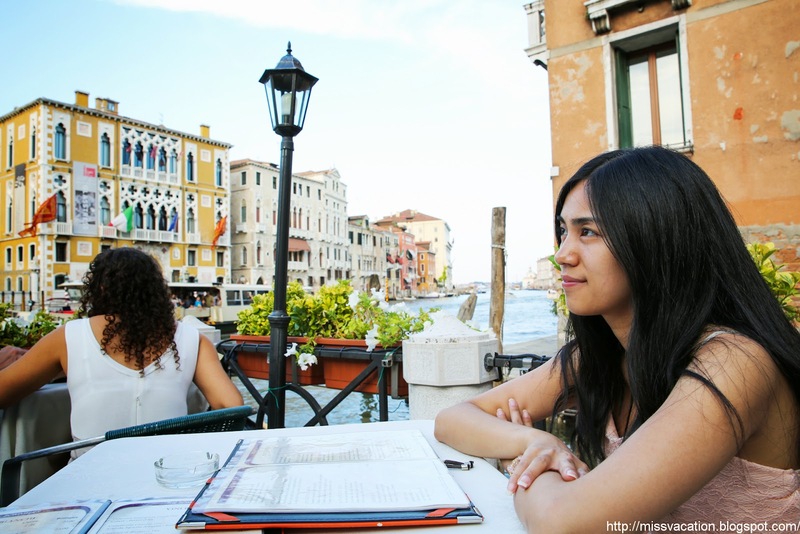 We went to the ATM machine to get some cash and then we were too lazy to find a restaurant so we had our dinner at Bar Foscarini, right next to Accademia Bridge. 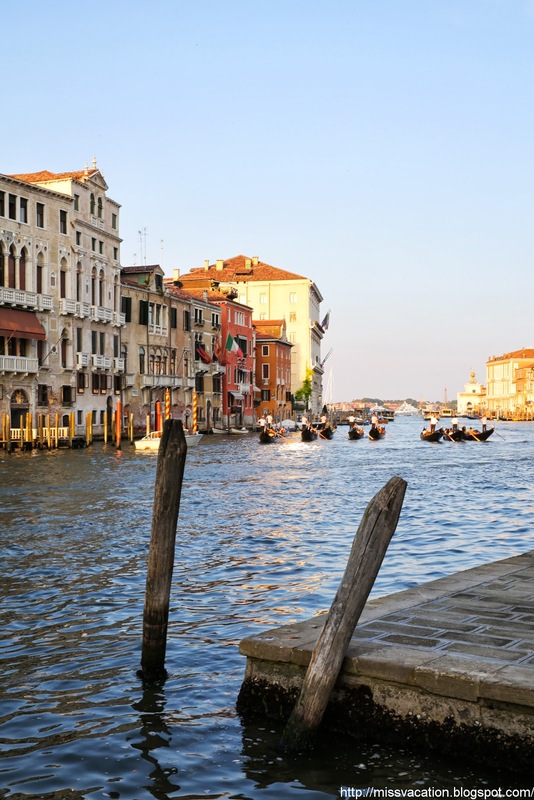 The view was breathtaking of the Grand Canal! We ordered two pizzas, prices were a little bit more expensive than what we seen but it was reasonable for its location! 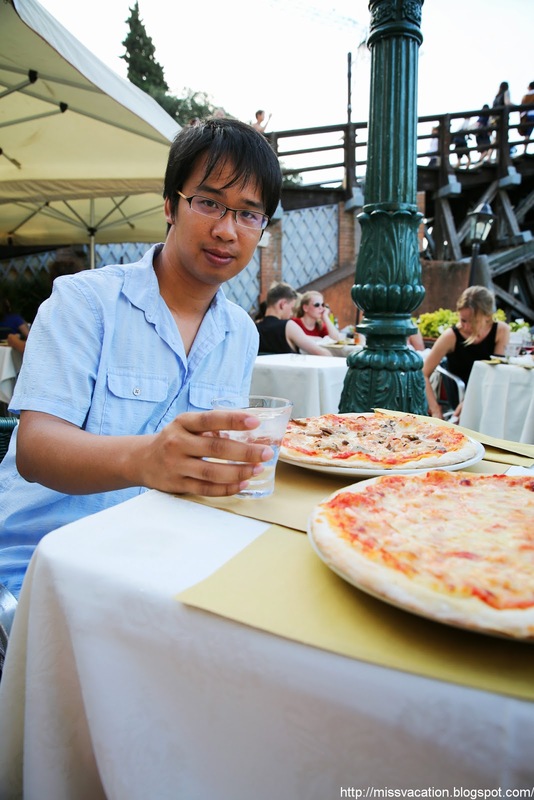 Total for two pizzas and a bottle of water was 30 euros (the cheapest dinner we had in Venice!). Yummy!! 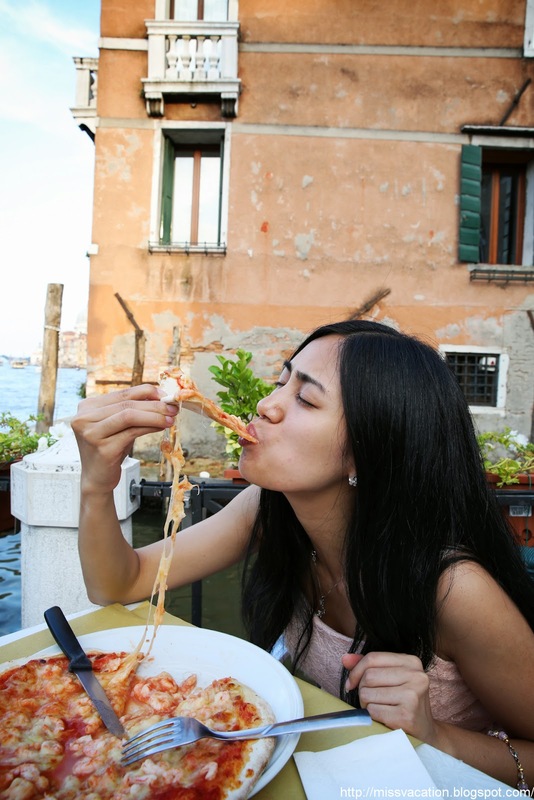 We don’t think it’s possible to have a bad pizza in Italy!!! 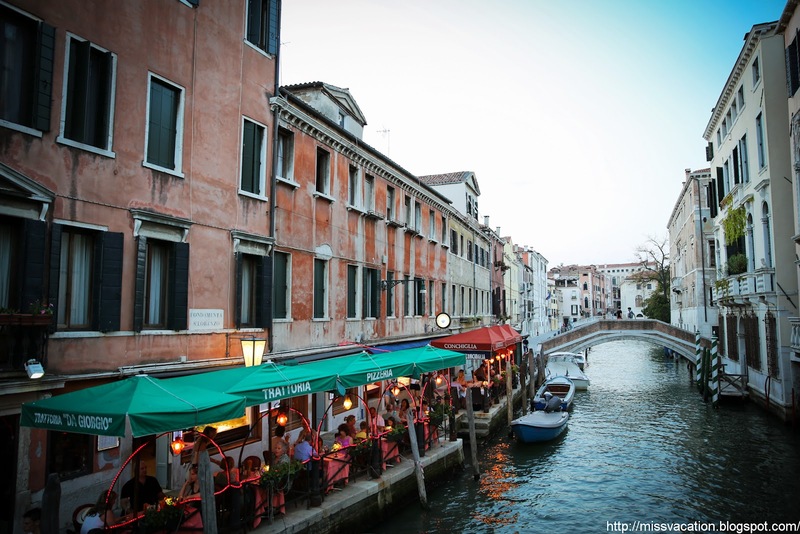 As we were enjoying our pizzas, we saw 8 gondolas passed by, must be a tour group or something! 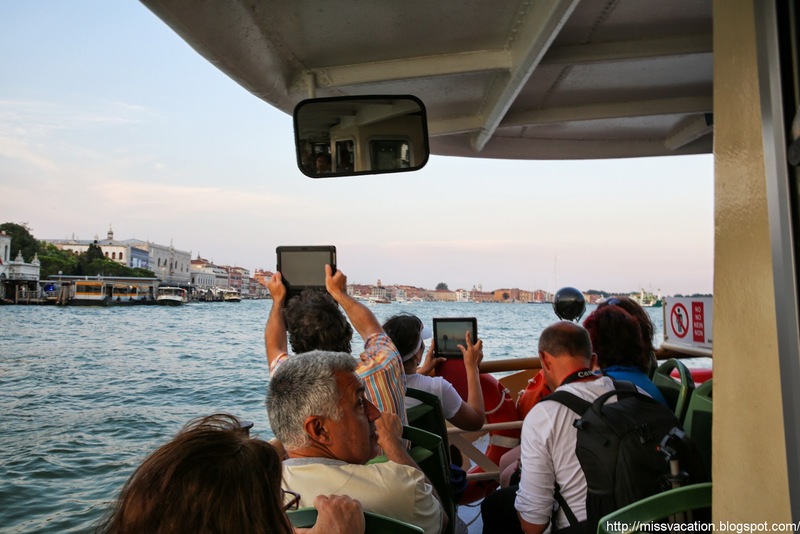 After dinner, we took the water bus back to St Mark’s Square on the way people were taking photos of the Grand Canal……with their iPads LOL!! 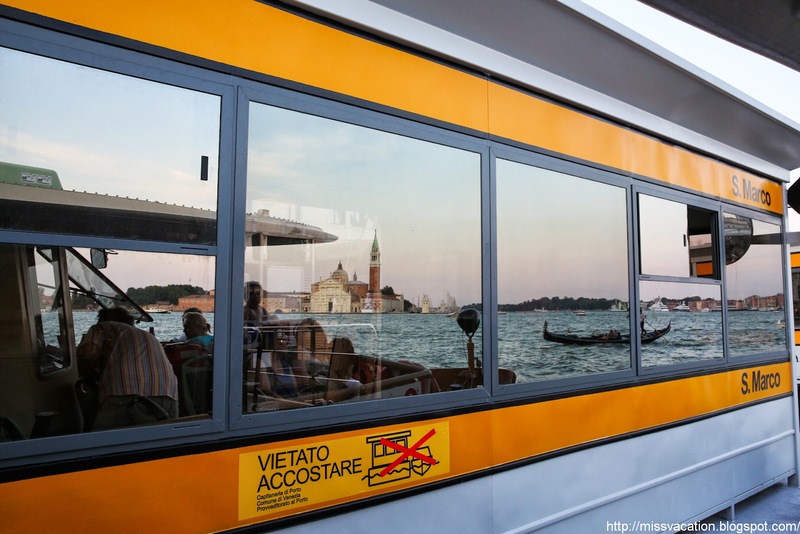 Reflection of San Giorgio Maggiore on one of St Mark’s Square water bus stops’ glass windows, I thought it looked like an advertisement banner! It was still early when we got back to St Mark’s Square so we decided to take a little walk before heading back to our hotel! 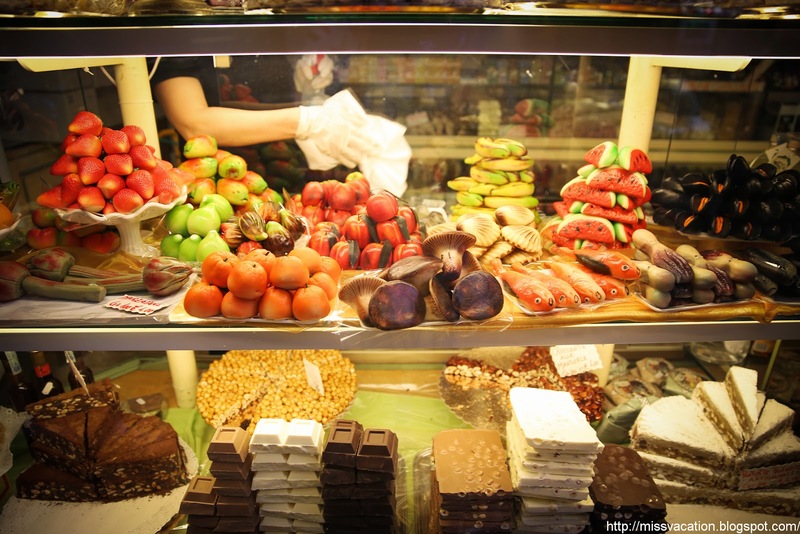 We passed by a bakery, wondered if those are pastries or candies…. 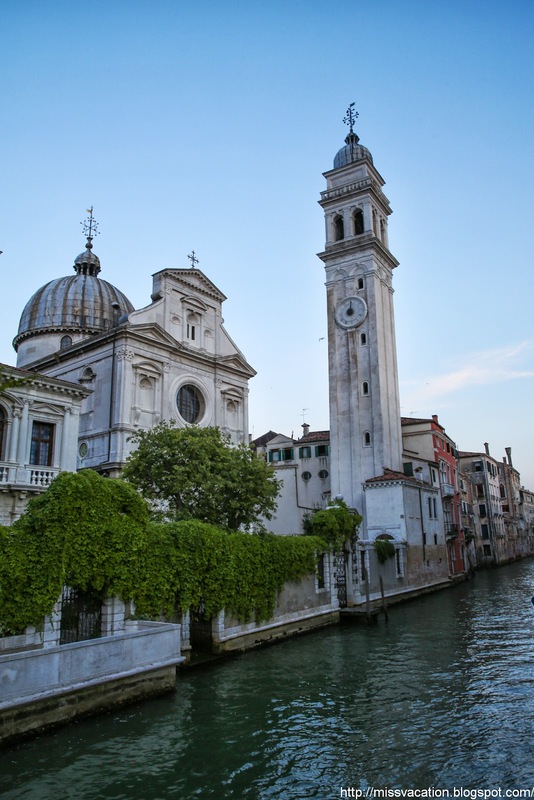 Another church and bell tower on the back side of St Mark’s Square…. Urggg..this building looked like it’s going to fall! 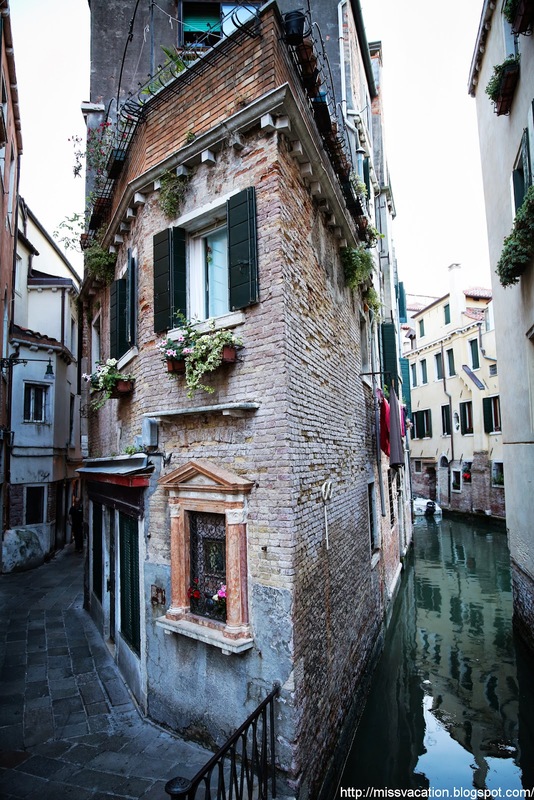 Speaking of narrow roads in Venice, here’s a very narrow house! The rest of the photos were taken late at night around 11 pm so not much people around the lobby and public areas hehe! Here are a few photos to share! 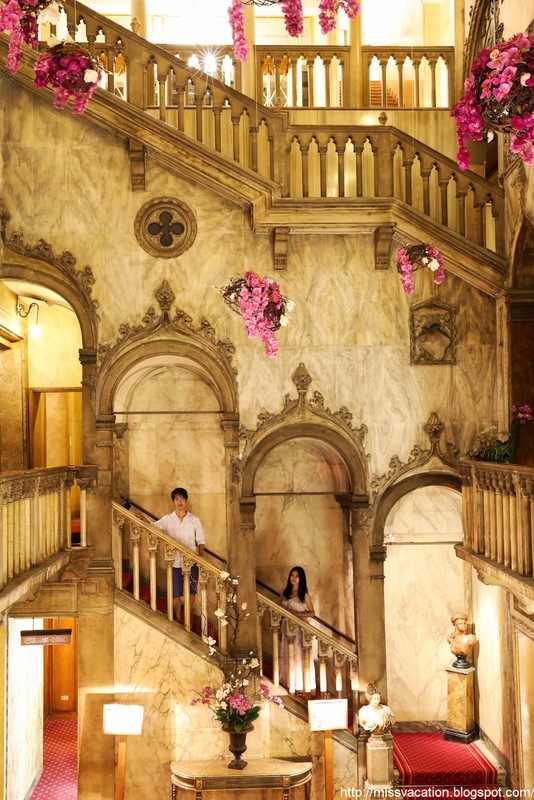 I like the angle of the staircase and the Murano glass chandelier on the top! 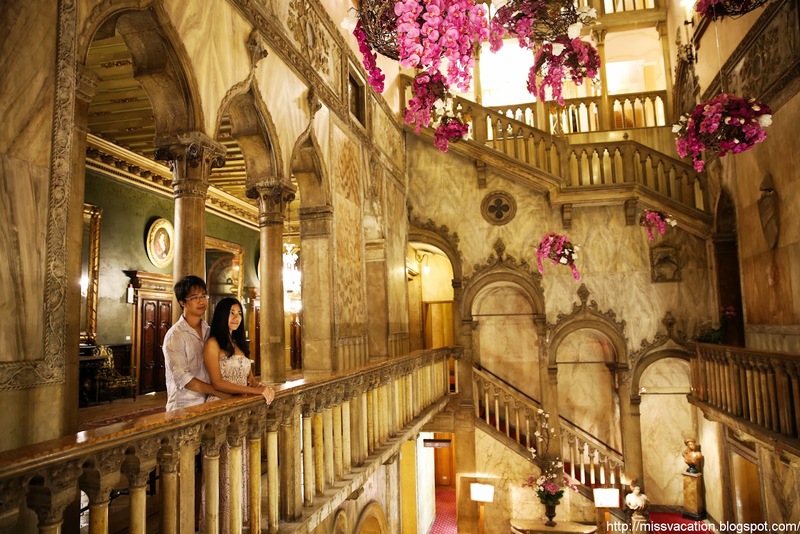 Photo of us with the famous Danieli grand staircase! Looked like painting of a king and queen hahaha! Can’t love enough of Venice! Another great day and great night! We Are Back to Venice! First of all, thank you for your wonderful blog and the photos, I feel like I am there with you! Thank you Roxanne! 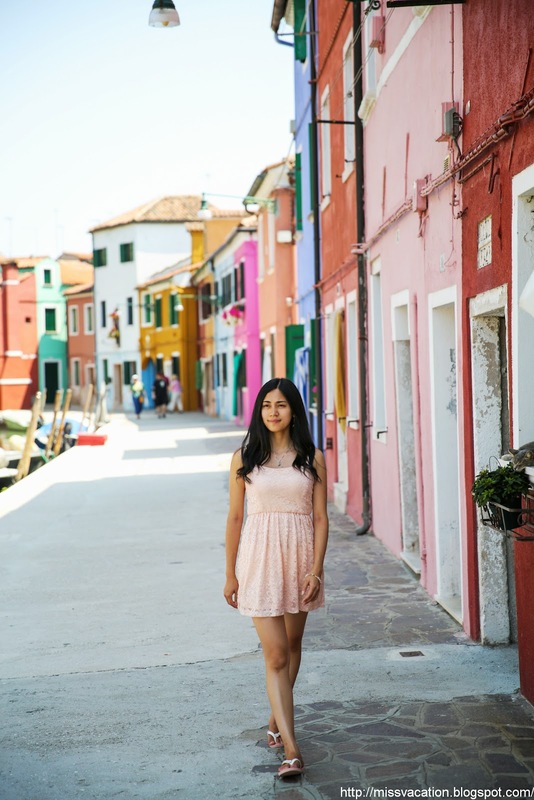 I would visit Burano again if I have only 2 nights as well, it'll bring back so much memories to be physically there! Have a great time there! Thanks Jess! You are correct, the photos were taken from two Canon cameras: Rebel T3i and 5D Mark III. 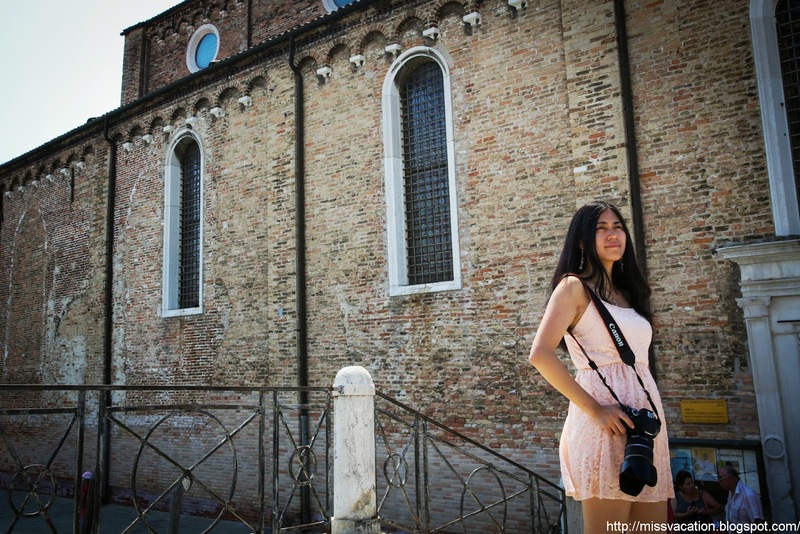 For the Rebel T3i, I use the 17-55mm f/2.8 lens and 5D Mark III, I use the 24-70mm f/2.8 II. Also, no need telephoto lens since the island is pretty small. I chose the f/2.8 lens to give a narrow depth of field in some photos. 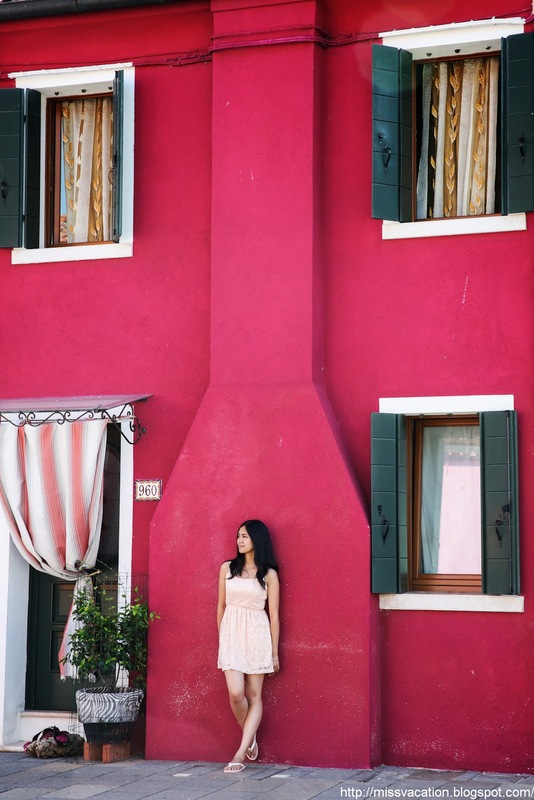 Burano is such a beautiful and colorful island that whatever lens you will be using will come out great. It's more important on what time of the day you will be visiting, I recommend either early in the morning or late afternoon. What kind of lens are you planning to bring with you? Hi! So sorry I must not have published my reply a couple of months ago lol. 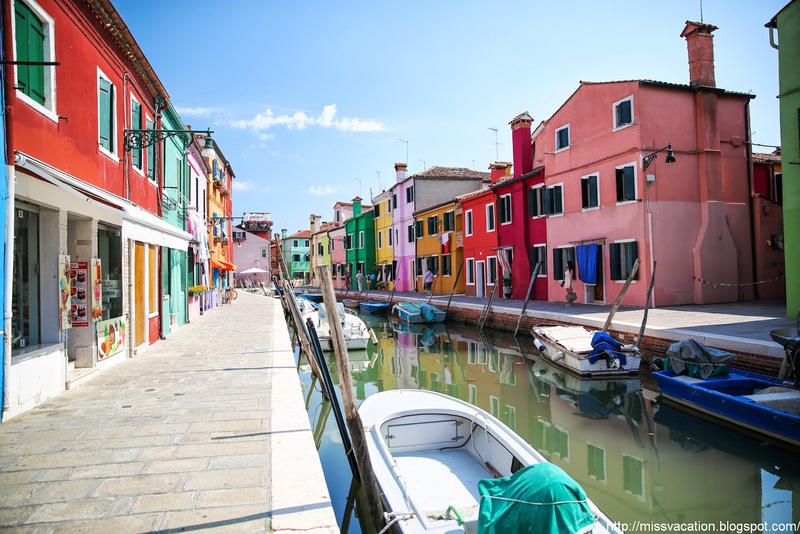 Thank you for your help with the lenses & info on Burano:) we will make sure we are there either first thing in the morning or late in the afternoon thanks for the tip. We don't have a camera quite as good as yours but on our Canon 60d we have a 18-135mm f/3.5-5.6 & looking at getting a 50mm f/1.4. We are pretty new to the dslr world but really just want to get some awesome shots. May I ask if you take raw images & edit them later? And is a lens hood a good idea? Hi Jess, yes a lens hood is a great idea and it's pretty cheap, not only that it helps to prevent lens glare and other light spills, it also protects your expensive lens (I tend to hit my lens on edges yikes). I set my camera to record both JPEG and RAW, it's more time consuming to edit in RAW but if you need the details, RAW is the way to go. On my other cheaper camera the T3i (which your 60D is better), I take in JPEG and usually happy about the results. If you choose to take in JPEG, change the color profile to Adobe RGB, the color spectrum is more vivid and wider range of colors. When are you going to Europe? Can't wait to hear back from your great trip! Hi MissVacation 🙂 ok great- thank you kindly for all your help & tips – I really appreciate it:) I hope we can get some photos just as awesome as yours! We don't leave OZ until around Easter time so it's around 10wks to go. Wow Jess, I am jealous….I wish I can spend 7 weeks traveling around! Nice finish with Santorini as that's my #1 favorite place on earth! When will you be at Santorini? We'll be there end of May/early June! Since you will be traveling for 7 weeks, don't forget a back up drive to back up your photos every day!!! Also, make sure you have two memory cards just in case, I have heard people's memory card got corrupted in the middle of their vacation! Hi! I stumbled across your awesome blog searching for Neuschwanstein Castle & fell in love with your pictures & stories they all sound & look amazing! 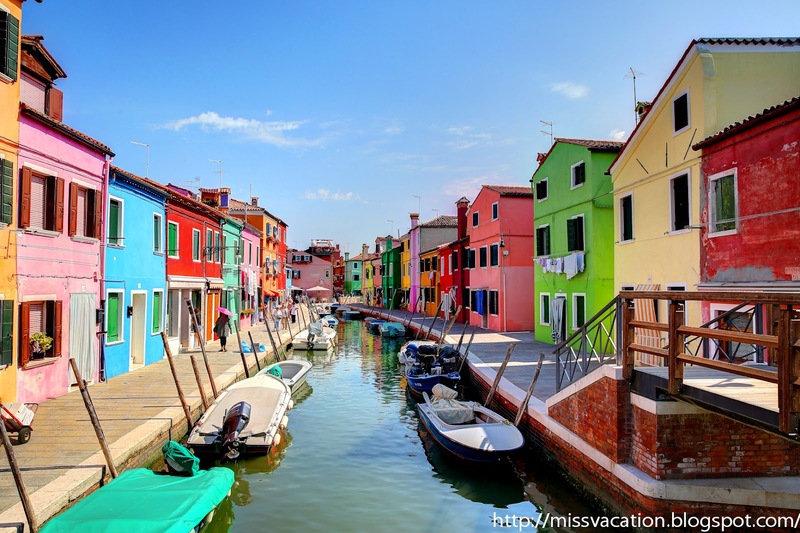 I was just reading the comments & how weird is this.. myself & fiancé are doing the same thing as ^ Jess, we are travelling around in a Motorhome starting in Munich as it was cheaper to rent then anywhere else in Europe & we will definitely now have to make a trip to Burano it looks amazing! I didn't even realise it existed! I cannot wait for Santorini I love that you got married in Santorini MissVacation it looked truly beautiful:-) I believe we will be there June 5th-9th not sure where to stay yet either. Thank you for the tips on backing up our photos we will definitely do that! Guess what Hayley???? We will be in Santorini the same time as you but I will be spending 6 nights!!! I am splitting 3 nights in Oia first and then 3 nights in Imerovigli. Since you are only staying for 4 nights, Oia is a great choice, it's the most beautiful village in Santorini 🙂 Have you ever consider having a couples or pre-wedding photo shoot in Santorini as it will be a very romantic setting! Really!!! How funny would it be if I bumped into you on the island somewhere lol! Where are you staying in Oia if you don't mind me asking? We have booked 2 nights at Marizan Caves & Villas in Oia & want to book in somewhere different for the remaining 2 nights to experience a different place, guess I had better book ASAP. We actually considered getting married in Santorini but our family being there is important & I don't think anyone would have made the trip all the way from Australia on such short notice. So we are getting married in Aus next year… be nice to make it back to Santorini for the honeymoon lol I think we are going to fall in love with the place soo much lol. I do love the idea of a couples/engagement shoot, not sure if there are any photographers on the island though, I will have to look into it.Your wedding photos are stunning!!! did you have a local photographer? I am sure you'll go back for more days haha first time I was there for 4 days and now I'll be back for 6 🙂 I booked a local photographer but his style is very traditional (look at the camera and smile that type), I would like a more artistic photographer if I choose again. So for this trip, we are going to take some shoots of ourselves with our best pal, tripod! I think I can do a better job hehe 🙂 But if you want to check out, his website is: http://www.santoriniwedding.info/ There are plenty of local photographers I heard since it's a popular wedding destination. No matter who the photographer is, the photos will not be bad because Santorini is too beautiful! Oh….forgot to answer your other question, we currently have Oia Collections booked but they are not responsive so thinking about a back-up plan now. I would not split 4 nights into different hotels since the check out and check in will take you half a day…..but if you want to experience a different place it's still doable. Ok great- thank you for all you help! 🙂 we will have to take our little mate tripod along also. Thanks for the accommodation advice too will be sorting the reaming 2 nights out tonight. site owners and bloggers made good content material as you probably did, the web will probably be much more useful than ever before.